Soft, kind Pisces-Pigs are always happy to help and sympathize even with unfamiliar people. They are distinguished by a rare spiritual unselfishness, gullibility and naivety. Often because of their openness and kindness get into unpleasant situations, but still continue to actively participate in the lives of others. According to the combined horoscope Pisces-Pig, a sensitive person with an open-heart. Peaceful, responsive, in every possible way avoids quarrels and conflicts. For him, the interests of close people and friends are much more important than their own. Pig-Pisces is not an egoist, completely fixated on himself, but a thin, vulnerable and very compassionate person. He can trust all his secrets, share his sorrows and sorrows: he will listen and comfort him. Such Pisces are impressionable, fragile natures, however, like all representatives of this watermark. However, the cheerful, carefree Pig can bring a touch of joy and positive into a boring routine. Pisces-Pigs are not so timid and defenseless before life’s adversity. These are people with a stable psyche and a positive outlook on everything that happens. They like noise and fun, they do not lose their positive attitude under the most unfavorable circumstances. They do not despair and do not give boredom to others. Nature has endowed them with an amazing ability to feel the mood of people. Each of the Pisces-Pigs can boast of strong intuition and rare insight. Quickly win people’s trust, understand their needs and aspirations. Emotional, compassionate Pisces-Pigs often can not contain their feelings: they are too susceptible to someone else’s pain. Sometimes they get so overwhelmed by misery and suffering that they fall into long-term depression. Fortunately, the Pig’s natural optimism helps them to quickly get in shape, does not allow them to completely plunge into the abyss of mental suffering. Pigs-Pisces, despite the external fragility, have a strong character. These are irreconcilable fighters with injustice and evil, fiercely defending their point of view. Although sometimes harmful and cause trouble because of their bad mood and extreme fatigue. Pigs-Pisces are rare, but they are capricious and stubborn. However, to see them in this state is possible only in exceptional cases. The main feature of the Pisces-Pig sign is reluctance to conflict. He does not enter into quarrels and tries to protect others from reckless acts. Ready for any sacrifice to reconcile the warring parties. He is able to find the right arguments, he enjoys authority among his acquaintances. Likes to arrange holidays, often collects all friends and relatives at a large table. Pig-Pisces, like no other, is attached to close people, devotes all his free time to the family. Do not seek adventure and travel. For him, the house is a safe haven, the safest place in the world. Some Pisces-Pigs choose a remote job, so they feel more comfortable. And comfort and peace of mind are important components of their success. In personal relationships, Pisces-Pig is very trusting, completely given to the power of his feelings. She is looking for an ideal partner, needs love and care. Quickly attached to the object of his passion, he suffers greatly from an undivided feeling. On the love horoscope, Pig-Pisces is a gentle, romantic person, not in his character to rudely pursue his own. Aimed at marriage from the first days of acquaintance. He is inclined to idealize his partner, often gives him an imaginary merit. Pisces-Pig is an ideal family man: caring, attentive and devoted to his relatives. Strives for harmonious relations, there are almost no conflicts in his family. He tries to meet the expectations of his half, devotes much time to raising children. Pig-Pisces is so dear to the family that it stops noticing what is happening around. His whole life is devoted to close people: the family is the meaning of his existence. Extremely negative attitude to divorce, in every possible way trying to save the marriage. The benevolent, hardworking Pig-Pisces is the ornament of any working collective. He is able to create a pleasant atmosphere, tries to establish relations with all colleagues. And not only responsive and attentive to employees, but also possesses all the qualities of a leader: the mind, purposefulness, discernment. Sometimes, people around him are surprised at his ability to succeed without fuss and unnecessary words. Pisces-Pig simply works responsibly, and does not try to prove its importance. Pig-Pisces has a subtle professional flair, finds the shortest path to success. He does not always think logically, but simply intuitively suggests how best to act in this situation. Conscientious, hardworking, focused on the result. It easily achieves recognition in professional circles, has a reputation as a good specialist. Pisces-Pigs will be able to take place in the creative field, have a passion for drawing and acting. No less in demand as educators and psychologists: they are able to work with people, especially with children. Pisces-Pigs are good men, sensitive to the problems of others. With great pleasure and willingness to respond to requests for help. Soft, vulnerable natures suffer agonizing suffering even from minor quarrels and conflicts. Therefore, they try to try on everything, they spare no effort to find a better solution to the problem. He enjoys special love and respect from his subordinates. But close people unabashedly exploit the man Pisces-Pig. This is the most devoted husband and father, ready to endlessly please his family. In difficult circumstances, he can show rigidity, firmness and even fall into a rage, but such behavior is a rare exception. Pisces-Pigs women are a subject of admiration for many men. Soft, gentle people behave with restraint and tact, they never raise their voices. These are real women, set as their goal to surround loved ones with love and care. Absolutely lacking in ambition, they do not try to prove their own superiority. With great respect for her husband, support him in every possible way. If necessary, they can change their place of residence and occupation, and they will do it without regrets for the sake of the family. 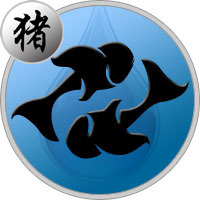 Pisces-Pig women are emotional, impressionable, but in case of danger they are capable of decisive action. Their strength of will, restraint and calmness can only be envied.